1970 The 1970 Mustang Mach 1 Twister Special was a promotional special model sold only in the Kansas City area. The promotion was limited to 96 cars and all were Grabber Orange Mach 1 Mustangs with either the Super Cobra Jet Ram Air engine or the new 351ci Cleveland 4 valve V8 engine, Drag Pack suspension, a tornado decal on the rear fender with the words Twister Special, and all obviously for a special price. 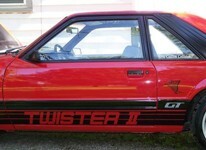 1985 Offered in two shades of red (Jalapena Red and Canyon Red) as well as white and silver, the 1985 Twister II Special Mustang sported black side stripes and Twister II lettering as well as a black striped hood. The Twister was only offered in the Kansas area and could be ordered with on any GT (convertible or hatchback) with any GT options. The Twister was first offered in 1970 but only came on the Mach 1 in Grabber orange, and in 2008 as an aftermarket Grabber Orange GT upgrade; but both in the Kansas area only. 76 hatchbacks and 14 convertibles were sold as Twister II Specials. 2008 The 2008 Mustang GT Twister Special is built by R&A Motorsports; and only comes in Grabber Orange; and only in the Kansas City area just like the first 1970 Mach 1 Twister, Kansas City, Mustang promotion. The 2008 Twister is limited to 96 coupes and convertibles. Besides all the Twister graphics and badges, the modifications include Foose 20 inch wheels, shaker hood and hood scoop, duck wing spoiler, sequential tail lights, custom black top and rear deck panel, rear quarter window panels, and a tri-bar pony on the grille.